The modern day road warrior surely has his or her fair share of responsibilities at the office, and then upon arriving home, there are house chores to deal with. All of this stress does add up at the end of the day, and this means that getting a good massage or rub down is extremely appreciated. 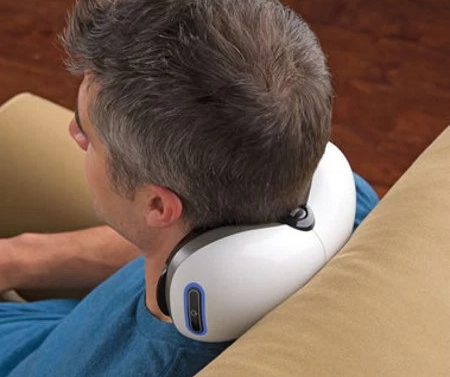 While there are a number of DIY massagers around, how about one that specifically targets your head? The $89.95 Adjustable Fit Dual Head Massager works as its name suggests – it will sport dual heads that flex and adjust to reach the exact right spot, soothing tired and aching muscles throughout the body – and not only your head. Being available from Hammacher Schlemmer as an exclusive, it has been specially shaped to look like that of a clamshell, where it can be articulated to open to 100°, 120°, and 140° angles, allowing it to target both shoulders, the inner and outer thigh, or both sides of the lower back. There are two treatment speeds to choose from, with the versatile device arriving with a couple of sets of treatment heads: three-pronged paddles, protected by mesh, knead the tougher muscles in the back and legs, while six stainless steel beads safely roll over the delicate skin of the face.